Pay-per-click (or "cost-per-click") advertising is offered to marketers by the major search engines like Google, Yahoo, and Bing. The most popular search engine to run search ads on is Google since they continue dominate search engine use (although their market share is declining). 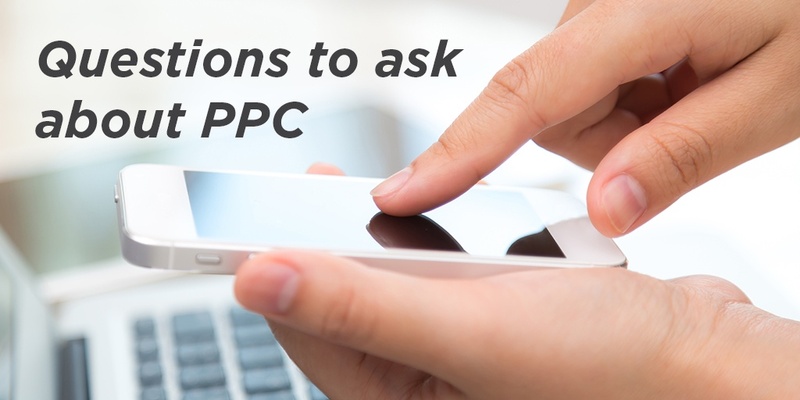 There are many ways to utilize PPC effectively, so following is a list of questions to ask about your PPC campaigns. 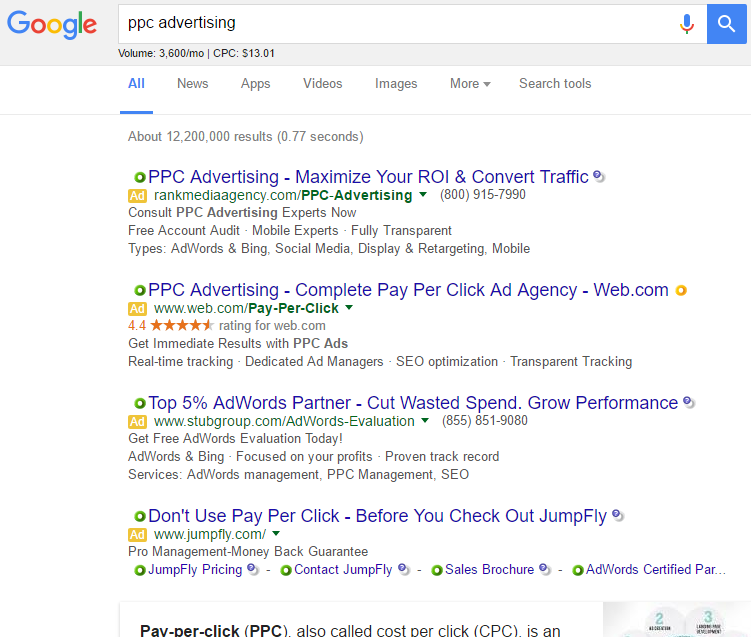 Before we do, though, it would be beneficial to explain what PPC does. At its most basic, PPC advertising allows business owners to advertise their websites in search engine results and on related websites within the Google Display Network. These ads help drive traffic instantly to specific product or landing pages on your site. You bid against others that are using PPC for the same keywords to determine which advertiser's ad displays higher on the page. In this example, PPC dominates above the fold. Most search results do not show any organic results until you scroll down, well below paid advertisements. Google currently uses a yellow "Ad" button to clearly indicate which links are PPC ads, and it displays up to four ads above the organic search results. Bing just shows the word "Ad" to the left of the URL, which in this case, is also dominating above the fold with paid results. 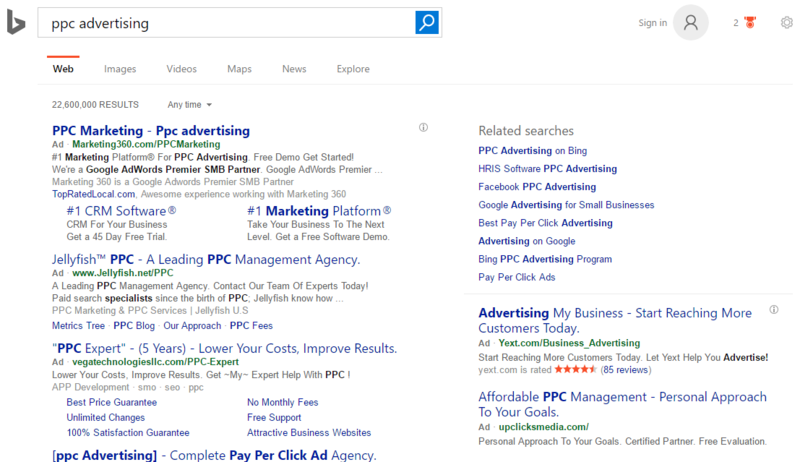 Bing still shows PPC ads in the right sidebar, unlike Google, which recently removed its sidebar advertising placements. 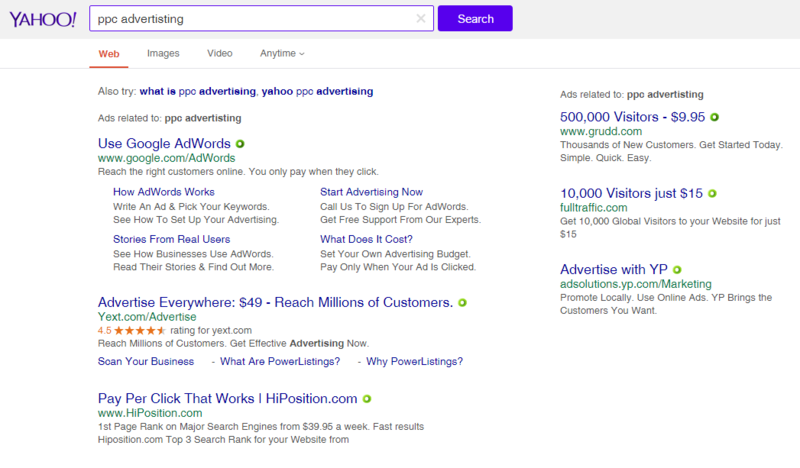 Yahoo shows ads under "Ads related to:" and also shows them in the right sidebar, similar to Bing. As with the other search engines, searches with enough PPC bids dominate the above-the-fold search results over organic results. Is PPC a short- or long-term strategy? Depending on the industry, your business, and your cost per lead, PPC can be a short-term strategy. To create and maintain a successful strategy, you need the data to have a successful campaign or you could burn through a lot of money very quickly. To build a successful PPC campaign, you have to determine at what cost you break even and how many products or services you would have to sell to justify an ROI on ad spend. 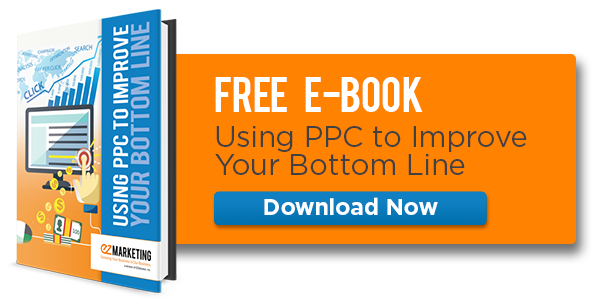 PPC can be a great long-term strategy because you can turn the campaign on and off as you wish. As for a long-term strategy, ongoing split-testing with more data can further improve the campaign to enhance your ROI month over month. There are plenty of horror stories of in-house marketers doing PPC who are not AdWords Certified (Google's distinction for those who meet rigorous standards to understand PPC campaigns) or simply have no idea what they are doing. You could easily overspend if you aren’t targeting the right keywords, and filtering out negative keywords as they come in as irrelevant search terms. If you don’t have someone in-house that is certified and experienced in AdWords, then it's probably a better idea to outsource it or hire someone that is well-practiced. Without an experienced professional, you may end up with a campaign full of low quality scores. Low-quality ads require your bids to be higher than others just to achieve the same placement. You need to have access to make changes to your website content to help increase low quality scores. So if you also don't have an in-house web developer, then it is likely something you should outsource. If outsourcing your PPC campaign, ask the vendor if they are AdWords Certified and/or a Google Partner. If they do not have at least one certified team member, you can filter them out as a legitimate agency offering PPC as a service. Once you have determined their credentials, ask for an estimated budget and cost per click for certain buyer keywords pertaining to your industry. You want to see whether a campaign will bring you the impressions, clicks, and conversions that you need it to within your budget. Also, based on the products and services you are selling, ask if it is feasible to earn a positive ROI that justifies a PPC campaign. In a competitive market, if you are spending a lot per click but your campaign doesn't lead to a big enough margin for profit, it's probably better to spend your money in other marketing channels. What are some important PPC metrics to understand? Quality Score - Gives your ads a score based on quality and relevance, along with the landing page and content that it leads to. Click-Through Rate - Not to be confused with conversion rate, your click-through rate is the ratio of clicks to impressions (or how many times your ad displayed versus how many times it was clicked). Conversion Rate - How often an interaction with your ad leads to a defined conversion on your site. Cost Per Conversion - How much did each one of those conversions cost? ROI - Your return on investment - is the cost of each of those conversions still bringing you a profit? Call Tracking - Outside of a defined conversion, a call tracking number helps you clearly identify calls that are coming directly from your PPC ads, and not elsewhere online or from your website. How do you split-test and optimize PPC? To really understand the success of your PPC campaigns, try split-testing keywords with three or so ads in a daily rotation. Take notice of what the CTR, or click-through rate, is for each ad. If it's lower than 1% on all ads, then you should consider switching them out of the campaign for a better-performing ad. It could be that you are targeting the wrong keywords or just that the ads are under-performing. If there is an ad that has a higher click-through rate than the other ads, then pause the ads that aren't converting as much so the best ad is always being displayed. This allows you to maximize your budget while you avoid spending on ads that just won't perform. If there are keywords getting irrelevant clicks or that have a higher cost-per-lead conversion rate, then pause those ad groups or remove those keywords too. You need to be filtering out negative keywords so that your ads aren't showing up and being clicked on for irrelevant searches. If you don't filter out those irrelevant keywords, than users that click on your ads will bounce from your site. When users don't find your ads to be helpful or relevant, you can end up with a low AdRank or quality score... not to mention you will be wasting money. You could also be spending money on ads in the wrong locations, the wrong days of the week, and even at the wrong times of the day. For example, most restaurants generally would want to spend more on advertising over the weekends and less during the weekdays when business tends to be slower. You should also be taking advantage of extra features like site links, locations markers, tags, clickable phone numbers, reviews, seller ratings, and social extensions. Missing these extensions can result in sub-optimal click-through rates and a poor performing campaign. If you put forth the right questions - and know the answers that you should be looking for - when running or outsourcing a PPC campaign, your results can only improve. So make sure you know what to ask about PPC: what search engines would be the best fit for your business, an estimate on what you can expect to spend to get to the top of the PPC auctions, if you should do it in-house or outsourced, what you need to break even and see a profit, the metrics you should be paying attention to, and how to continuously split test and optimize your PPC. The answers to these questions could result in campaigns that generate a huge return on the investment you've made with paid search.